Typhoon Lan has been undergoing rapid intensification on Thursday night and Friday, and will likely reach super typhoon status by Saturday morning. 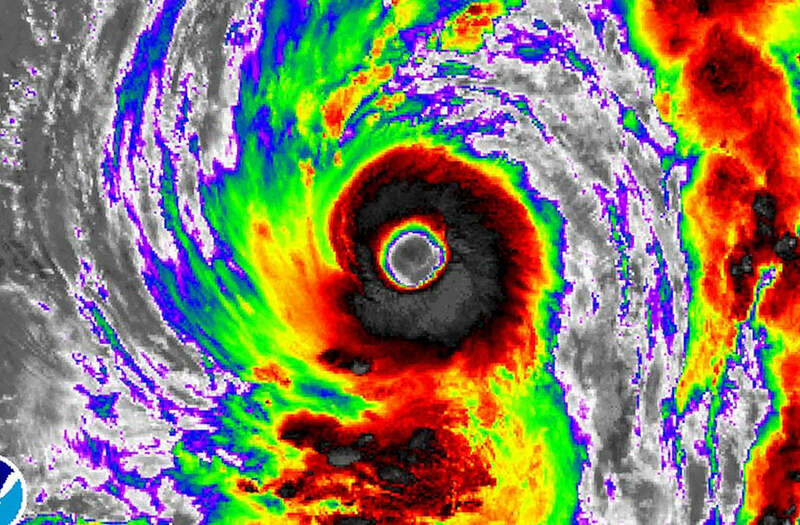 Such a threshold is crossed when a typhoon has sustained winds of at least 150 miles per hour. The storm is in a favorable environment for strengthening and is likely on a collision course with highly populated areas of Japan. Satellite intensity estimates show that Typhoon Lan may have already strengthened to Super Typhoon intensity, however, the Joint Typhoon Warning Center (JTWC) has not yet updated its official intensity estimate to show this. Conditions appear ripe for further strengthening on Friday and Friday night, eastern time. Typhoon Lan is forecast to move to the north-northeast during the next few days, peaking in intensity early in the weekend before encountering cooler ocean waters and strong upper-level winds that will cause the system to lose some of its punch. The typhoon is forecast to move just off the Japanese coast, passing near the city of Kyoto on Oct. 22 and near or directly over Tokyo between the 22nd and 23rd. At that time, the JTWC, predicts the typhoon will be a large Category 1 or 2 storm, though it may also be transitioning into a large and powerful non-tropical system. Nevertheless, it could bring multiple hazards to the Tokyo area, including storm surge flooding along the coast, inland flooding from heavy rains, as well as strong, damaging winds that could cause widespread power outages. Paramilitary policemen remove toppled trees after Typhoon Meranti swept through Xiamen, Fujian province, China, September 15, 2016. REUTERS/Stringer ATTENTION EDITORS - THIS IMAGE WAS PROVIDED BY A THIRD PARTY. EDITORIAL USE ONLY. CHINA OUT. NO COMMERCIAL OR EDITORIAL SALES IN CHINA. A damaged chimney is seen at a factory before Typhoon Meranti makes a landfall on southeastern China, in Quanzhou, Fujian province, China, September 14, 2016. Picture taken September 14, 2016. REUTERS/Stringer ATTENTION EDITORS - THIS PICTURE WAS PROVIDED BY A THIRD PARTY. EDITORIAL USE ONLY. CHINA OUT. NO COMMERCIAL OR EDITORIAL SALES IN CHINA. Streets are seen flooded after Typhoon Meranti made landfall on southeastern China, in Fuzhou, Fujian province, China, September 15, 2016. Smudges in picture are caused by raindrops on the lens. REUTERS/Stringer ATTENTION EDITORS - THIS IMAGE WAS PROVIDED BY A THIRD PARTY. EDITORIAL USE ONLY. CHINA OUT. NO COMMERCIAL OR EDITORIAL SALES IN CHINA.?? People wade through a flooded street after Typhoon Meranti made landfall on southeastern China, in Fuzhou, Fujian province, China, September 15, 2016. REUTERS/Stringer ATTENTION EDITORS - THIS IMAGE WAS PROVIDED BY A THIRD PARTY. EDITORIAL USE ONLY. CHINA OUT. NO COMMERCIAL OR EDITORIAL SALES IN CHINA. A man rides through a flooded street after Typhoon Meranti made landfall on southeastern China, in Fuzhou, Fujian province, China, September 15, 2016. REUTERS/Stringer ATTENTION EDITORS - THIS IMAGE WAS PROVIDED BY A THIRD PARTY. EDITORIAL USE ONLY. CHINA OUT. NO COMMERCIAL OR EDITORIAL SALES IN CHINA. A car is seen under toppled trees after Typhoon Meranti swept through Xiamen, Fujian province, China, September 15, 2016. REUTERS/Stringer ATTENTION EDITORS - THIS IMAGE WAS PROVIDED BY A THIRD PARTY. EDITORIAL USE ONLY. CHINA OUT. NO COMMERCIAL OR EDITORIAL SALES IN CHINA.